Feelings and Emotion Week was full of just that, Feelings and Emotions! Through play, hard work, and discussion, the students practiced identifying and recognizing all sorts of feelings and emotions throughout the entire week! Read on below to learn about all the fun that was had and learning that took place! 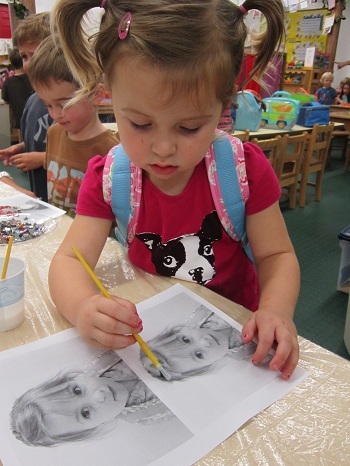 For their morning work on Monday and Tuesday, the students created a “Feeling Faces” Photo Album! One by one, the students came over to have their photograph taken under a sign showing one of the following feelings: Happy, Sad, Angry, or Silly! 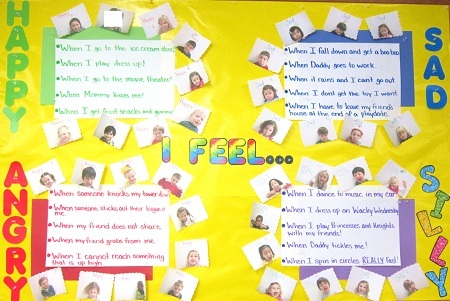 The students blew the teachers away with their ability to show each feeling with such extremely expressive faces! 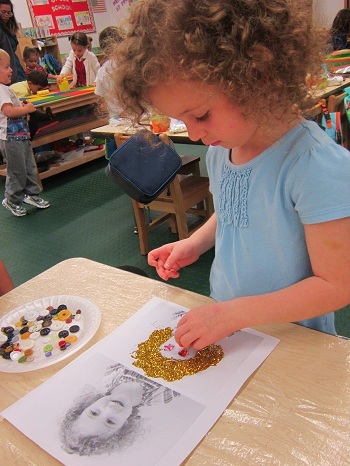 Here are some of the photos from the students “Feeling Faces” activity. What amazing expressions! The photographs came out so great that the teachers created a bulletin board from the Monday students photos. During the afternoons of “Feelings and Emotion Week”, the students discussed each feeling by creating a list for a few of the more common feelings. Here are two of the lists they came up with. On Wednesday, the teachers relied on a storybook character, the Pigeon, to discuss Feelings and Emotions. The Pigeon, the star of author Mo Willem’s children’s books, is by far the silliest character in PPA’s entire library! The returning students are very familiar with the Pigeon and his silly ways, while the new students of PPA have just begun to get to know him. 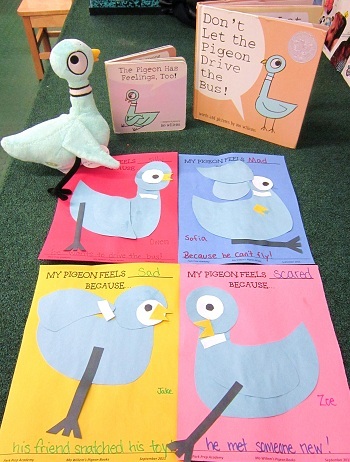 To help show how silly the Pigeon really is, the teachers brought out the Pigeon’s most well-known story titled, Don’t Let The Pigeon Drive The Bus! In the story, we meet the Bus Driver who needs to leave for a while. 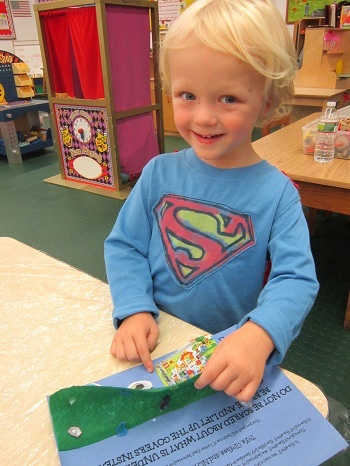 Before leaving, he asks the readers to do him a very important favor – Don’t Let the Pigeon Drive The Bus! Shortly after, the Pigeon makes his very loud and very persistent debut. From the title, you can probably tell that the Pigeon really wants to drive the bus! Thankfully the readers are there to remind him that he cannot drive the bus and before long the bus driver returns. Throughout the story, the Pigeon expresses his feelings of Happiness, Silliness, Sadness, Anger and Frustration very clearly. So who better to make a “Feelings and Emotion Week” craft in honor of? Here are how the student’s Pigeon project turned out. Be sure to take a peek at the following video for a particularly great student version of the story! 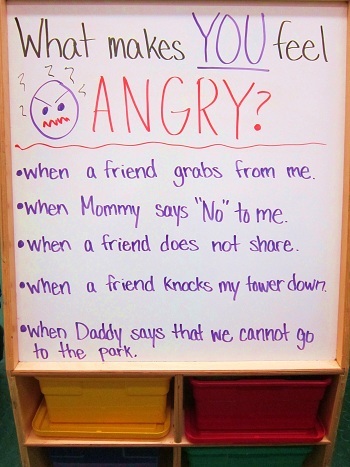 On Thursday, the students tackled a difficult feeling/emotion – Scared. The teachers started the day by reading the book, Creepy Things Are Scaring Me, written by Jerome and Jarrett Phumphrey. In this story, a little boy gets tucked into bed for the evening. Shortly after his Mommy leaves the room, the little boy starts to hear some scary noises and see some scary shadows around his room. He becomes very worried and scared so he calls for his Mommy who helps him learn what the noises and shadows around the room really are. Drawing on this idea, the students created their very own “Under My Bed” art project. First, the students discussed the story with the teachers. 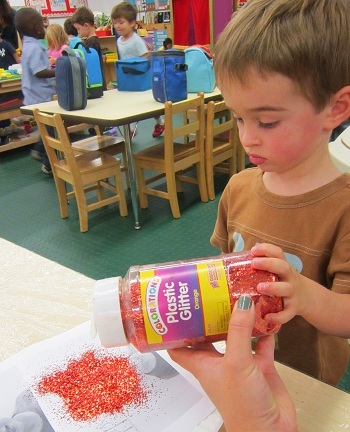 After recalling that the little boy only had toys around his room and a puppy under his bed, the students selected some of their favorite things from magazine clippings. 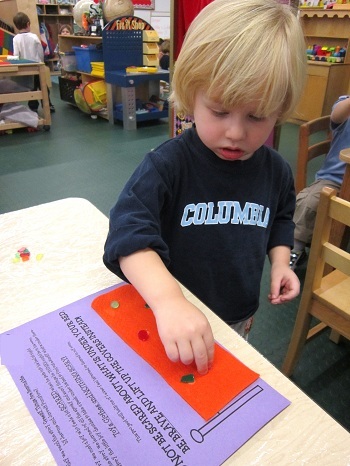 Using glue, they added several toys and/or articles of clothing underneath their “bed”. 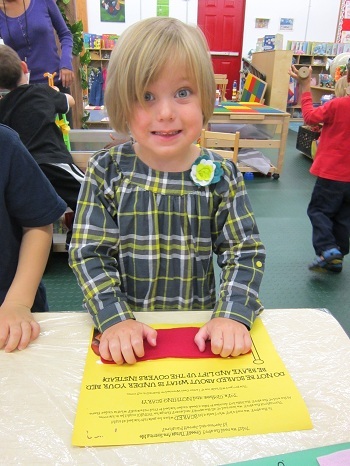 Next, the students added their felt blanket and decorated it. Finally, a cushy comfy cottony pillow was added and the project was complete. The students enjoyed peeking under their own and their friends beds. It was clear from the big smiles on their faces that the students are quite BRAVE! During the afternoon, the students participated in the first technology presentation of the year! They were so excited to learn that not only would a technology presentation be taking place – they were the stars! 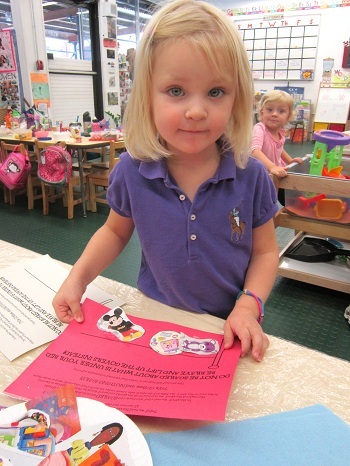 The teachers compiled all of the photographs from earlier in the week into a slideshow! The students practiced identifying their friend’s feeling and name as each face scrolled on the screen! Although the students faces looked Happy, Sad, Angry, and Silly, one thing was for sure, the only feeling they felt was Happy! 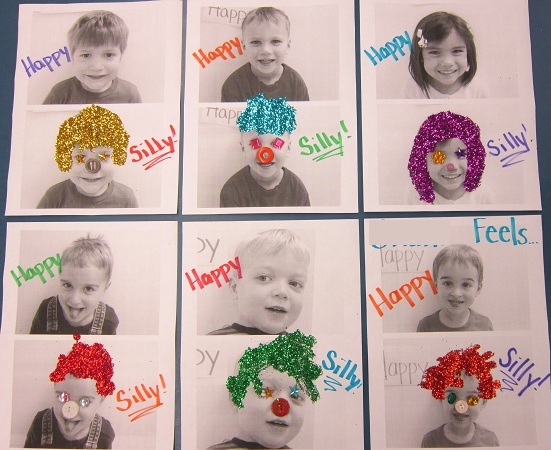 On Friday, the students wrapped up “Feeling and Emotion Week” by creating an art project about their two favorite feelings – Happy and Silly! 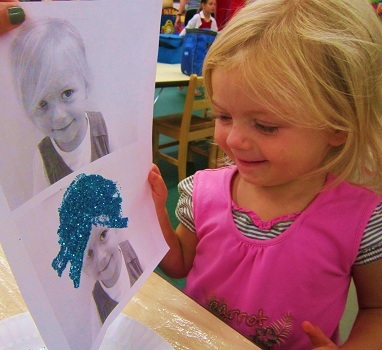 Using the photographs from earlier in the week, the students used glitter, gems and buttons to transform their Silly faces into EXTRA Silly Faces! Needless to say, the students LOVED their new Silly look! Here are some of the projects – one from each hair color! Speaking of silly, the students were suprised on Friday afternoon when they learned that some of the teachers had been added to the technology presentation! What an amazing (and silly) week! Be sure to take a look at the bottom of this blog post for the link to the Feeling and Emotion Week Photo Gallery! As always, thank you for reading. See you next week! Wednesday – Health Care Professionals: Doctors, Nurses, Paramedics, E.M.T. Paramedic “E.M.T. Tom” Shields Visits PPA! Jersey City Police Officer Lorenzo Tosado Visits PPA! Jersey City Postman Visits PPA!